A food mill is an incredibly versatile kitchen tool that I use all the time in canning applications. This post will explain how to use one, the types of recipes you can use to make the most of a food mill, and why you will love a food mill! I’m not a gadget girl at all, and in my tiny kitchen, I’m very selective about the types of gear I allow into my space. A food mill would make the cut, again and again, because of how useful it is, in and out of the canning space. A food mill basically presses food- fresh or cooked- against a plate with holes in it- so that what falls through is perfectly seed, skin, and tough-stuff-free puree and what remains up top in the hopper is refuse. They are amazing, and you need one. I use my food mill to make super smooth, almost seedless jam (that’s right-nearly seedless!) really easy, perfect applesauce (the easy part is not having to peel (yawn!) every apple first), and any recipe -canning or otherwise- where you want a fast, smooth result. I also LOVE that the food mill is NOT an electric appliance. This food mill is simply 3 metal pieces that fit together and I feel confident that they will continue to work (read: not suddenly quit working like a blender might) forever. The refuse in the top hopper is compost gold, and I usually scoop it out with my hands. To be fair, I’m a mom of small children, one of whom is a boy, so very little grosses me out. The peels and seeds can be wet and slimy so you could use a spatula if you still have some kitchen dignity. I have none when it comes to wet and slimy peels so I remove them with my hands and then unclip the top blade (I am calling this a blade very loosely. It isn’t sharp- it presses the food into the holes of the plate, like a presser foot of a sewing machine presses. It’s kind of like a snow plow blade.) and then remove the rest of the peels, seeds, etc from the blade and hopper. The plate easily pops out with a little pressure from below and I recommend removing as much as you can manually (which won’t take long) before using the faucet to rinse the rest away. PRO TIP: Of all the things you clean in a canning project, let this be the first. Dried on food on a food mill is a real bear. The preserving pan can soak clean, as can the funnel and ladle, but the food mill is a pain to clean the day after. Which Food Mill Should I Choose? I have this food mill. It’s lime green accents tell you it is part of the baby food making kit from Oxo. This simply means it is slightly smaller than the black-accented one. I LOVE that the legs have the grips- it is part of the Oxo “Good Grips” line (this is not a sponsored post, by the way) because having the legs firmly stationary on the bowl is very helpful. It comes with 3 plates (the same way a box grater has different sizes to yield different size slices of cheese) which I think is really important. I would recommend this food mill again and again. The only other style of mill I would suggest, based on ease of cleaning, ease of use, and quality of puree, would be this stainless steel model by Weston that also has 3 plates. It is dishwasher safe (I put my Oxo on the top rack of mine sometimes but I probably shouldn’t) and being all metal means it probably will last FOREVER. It interestingly has no legs- this means you’d have to set it directly into a bowl or saucepan that fit nicely around the mill and that potentially could be very nice from a ease of work standpoint. It is also affordable (as is the Oxo) and works the same way. What about the old-style Squeezo Strainers? Invariably, an experienced canner in your life will suggest to you (or even give to you- for free maybe!) an older style Squeezo Strainer (or similar brand). They look like this. The cone shaped part on the counter does the same job as the plates in the Oxo or Weston mills except the are harder to clean. The Squeezo Strainer is more expensive- new $200- and you have to clip it to a countertop or table. They are indeed high quality, have been trusted for many years by canners, and are all metal (except for that little bit of plastic on the handle). I prefer a food mill because they are easier to clean and the capacity is the same or greater- the hopper on the Squeezo above is 2.5 quarts and the Oxo food mill is 3 quarts. It IS nice to have a very firm and stable base onto which you are milling, and the Squeezo style definitely good for that, especially if you clamp it to a countertop. To me, the Oxo food mill wins because it is so easy to clean and is less expensive. Now, if you are given a free or cheap Squeezo – style strainer then use it! Understand that they do the same thing. They work in the same way and I’d encourage anyone to use a tool that was available affordably first. What Other Canning Equipment Do I Need? I have a rad little no-frills Canning Equipment Checklist you can download and print off (or just view from your computer or phone!) for free right here! Are You a Canning Newbie? 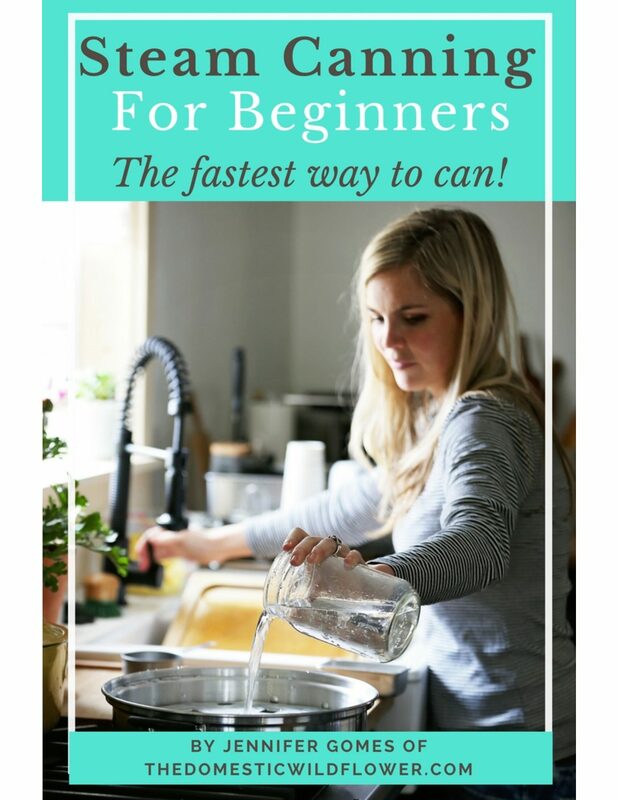 If you are still learning the canning ropes, I want to invite you to my completely FREE Canning Basics Course! I’ll pop into your email inbox with little lessons so you can put jars on your shelf! I wrote a pair of posts I think you will find really valuable: Best Home Canning Equipment for a Beginner and Canning Equipment for an Experienced Canner. Choose your own adventure, Wildflowers! I was so lucky to find a practically new food mill at the thrift store for $5. I use it all the time in canning and it is so much easier than a sieve and wooden spoon. That IS lucky! They really are great tools.